Peak Design was nice enough to supply me with their super handy camera strap, the Clutch. 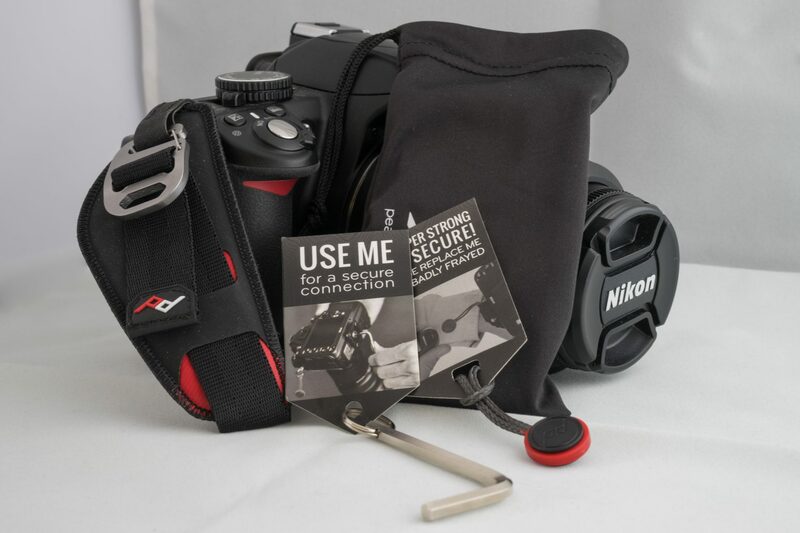 Want to know more about this super handy camera strap? Click read more, and find out if this can be the strap you were looking for all along! If I was to compare the Clutch to a car it would be a Landrover. It was never designed just to be pretty, it’s built for a purpose and be good at that. And by being all about essence it accidentally became pretty in the process. This practical approach reminds me of the DSPTCH sling and strap I reviewed earlier. Nothing like those fancy leather camera straps that are about the bling and looks first and about usability second. Back to the Peak Design Clutch, I was looking forward to using the Clutch with my new Sony A7 mirrorless camera. Since it’s a new camera I’m was planning some long shoots with my A7 to get used to it, and I barley used a neck- or shoulderstrap since I moved to the lighter and smaller mirrorless cameras. I tend to keep the camera in my hands, and if I don’t use it I put in my bag. But I do like the comforting feeling of a strap of some sorts keeping me secure. But regrettably the Clutch doesn’t really play nice with the Sony A7, or at least it doesn’t if you have big hands like I do. 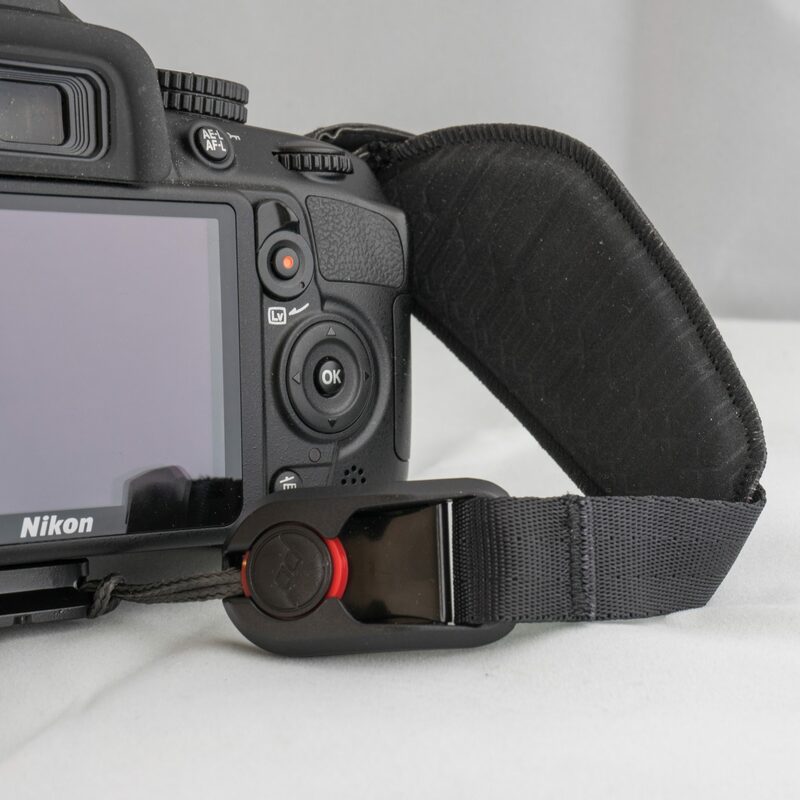 The shutter release is too far back and too high on the body to comfortably reach it with the Clutch around your hand (because of the design of the A7). Peak Design does know about this, and they added some pointers to help you decide if the Clutch will work with you camera. In short, if you have a DSLR you’ll probably be fine. If you have a mirrorless or other smaller camera you’d better check out this page before buying the Clutch: Using the Clutch on smaller camera’s. On the plus side, I guess it does look like it will work with the new Sony A7 M2 because that has got a bigger grip with the shutter release further to the front of the camera. 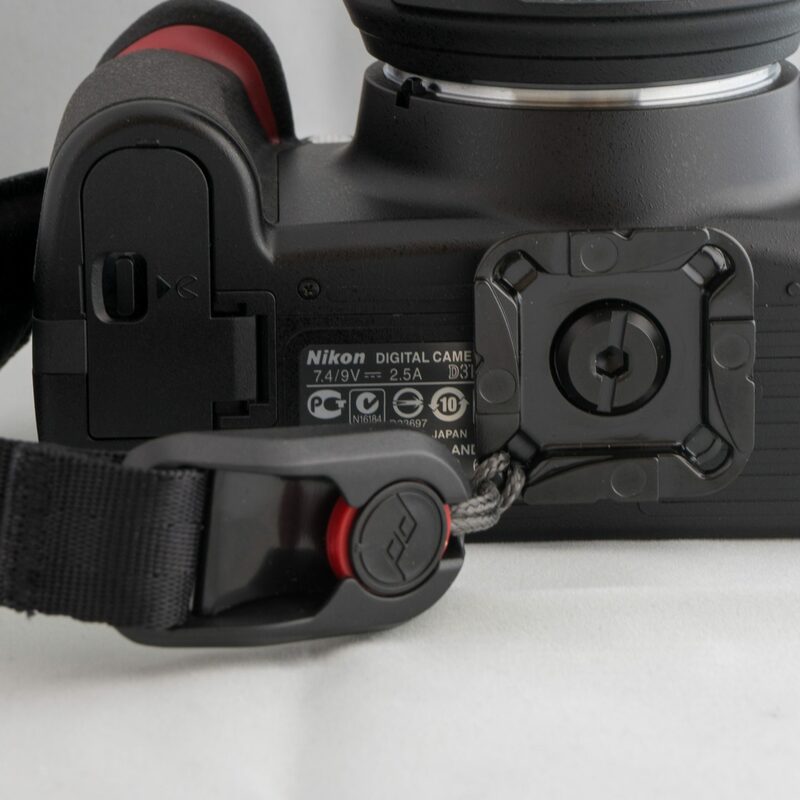 If the Clutch doesn’t work with your camera you might want to take a look at the Peak Design Cuff. This does have all the smarts and great materials you’ll find on the Clutch, but is compatible with all sizes cameras (and: it’s a little cheaper too). Since it doesn’t work on my A7 I’ve borrowed a Nikon D3100 to use the Clutch. As you can see it looks quite good on the D3100. The Clutch attaches to the top loop on the right side of the camera and to the tripod mount on the bottom with a rectangular baseplate. You attach the baseplate with a screw, and Peak Design supplies the kit with a hexagonal tool to fasten the screw in the bottom (but since it’s a standard size you can also use your own tools so you don’t have to worry if you lose the one Peak Design supplied). You can’t use your tripod mount with the baseplate mounted to your camera. Peak does have some smart accessories you can put on your tripod so the baseplate doubles as a quick release mount. Really smart design! The Clutch doesn’t add a lot of bulk or weight to your camera, its small and none obtrusive. The baseplate is about a centimetre high, since it is completely flat you can still set your camera down on a table. And it protects the underside of the camera when you put it down. The baseplate has got loopholes on each corner, with the clip pre-mounted in one of them so the rest of the loopholes is still free. The clip attaches to the top part of the Clutch with a reassuring ‘click’. This gives you the confidence it will keep your expensive gear safe. You can take the clip off by pushing down on it and sliding it backwards. Peak Design does supply you with a spare clip, in case you wear out or lose the original one. O, and Peak has put a little bag in the box to store the parts you don’t use every day (the hex-tool and the spare clip). The bag also works great to keep your keys or other smaller stuff in when you go shooting, and it’s got the cool Peak Design logo printed on it. It’s those little extras that add to the premium feel of this product. The Clutch itself feels very nice. The inside, where it touches your hand, feels a little like the material a wetsuit is made of, and it’s got a nice motif printed on it. It’s soft and durable, and does seem to withstand dirt and water quite well. It doesn’t irritate the skin. The outside is made of rubber or rubberized fabric in black and some red parts to give it a nice contrast (they match quite well with the red ‘Nikon-triangle’ on the front of the Nikon camera). The main loop is made of a sturdy synthetic material with a titanium coloured metal clip. The baseplate is made of anodized black metal with a rubber plate on the side that is attached to your camera to protect it from damage. You can feel that they really taught about every small part to make sure it doesn’t let you down when you are in the field. Well I’ve kept you busy with too much information about the Clutch itself. But the most important part is how it works in daily use. Luckily, I’ve got some good news. This Clutch works great. 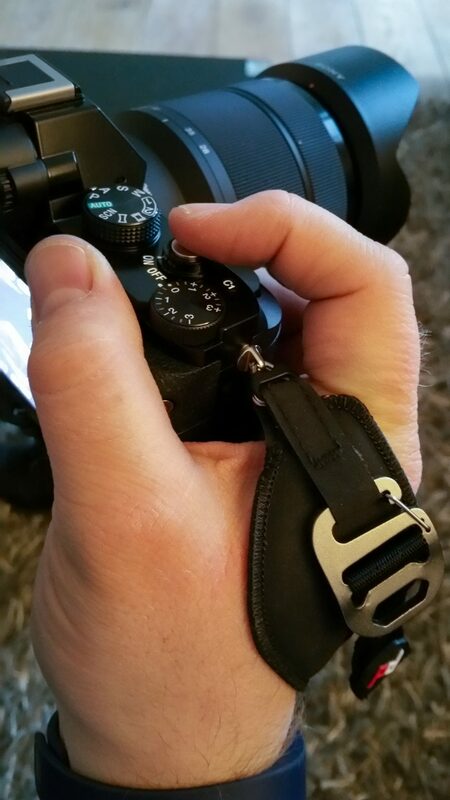 If you grab your camera you can easily adjust the length with one hand by pulling the strap. You can choose how tight you want it by pulling it harder, I chose to use it quite tight for that reassuring feeling that the camera is glued to your hand. The different parts are very strong, so you probably hurt your hand before you damage the clutch. If you are feeling lucky you might give it a little more play for some extra comfort and extra freedom to move your hand around. If you need all the freedom you can get you’re probably better off using a wrist strap, because a strap like this will always cling to your hands (like it’s supposed to). 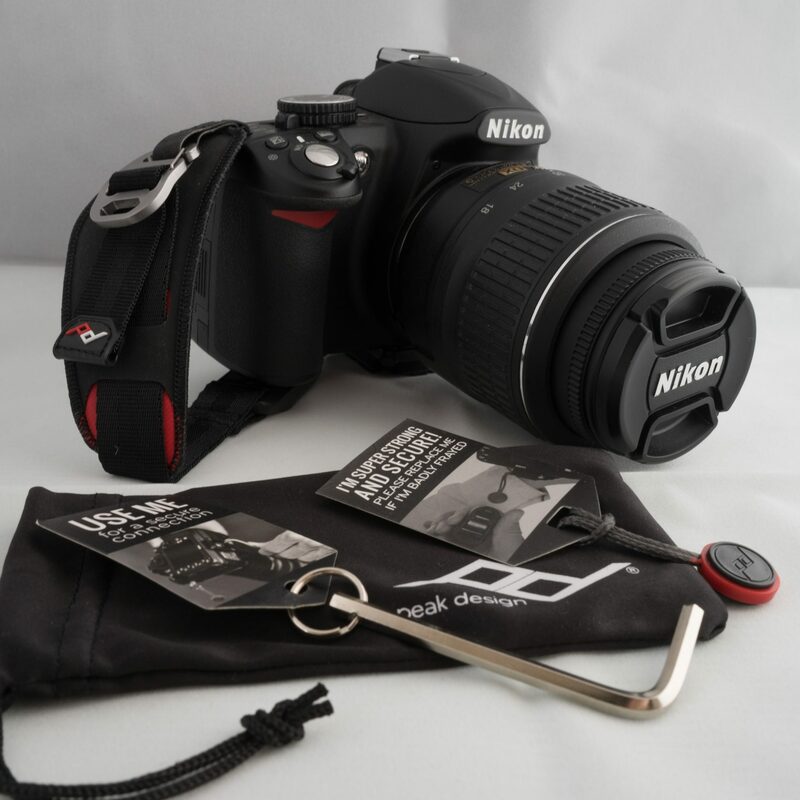 With the Clutch set tight you can let go of your camera and it will stay attached to your hand without a problem. This means it’s very safe, the camera can’t really fall out of your hands (unless maybe if you plan to do the Macarena, while basejumping, in a class 8 hurricane… You get the idea, it’s very secure). The Clutch also helps you keep the camera steady for shooting with slower shutter speeds. I loved using the Clutch, it’s a real shame it doesn’t work on my daily driver, the Sony A7, otherwise it would certainly be on my camera all the time. 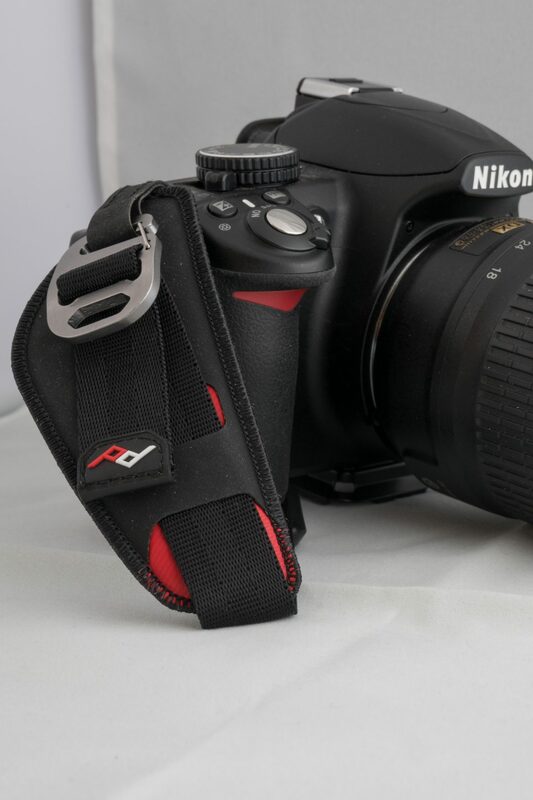 If you are looking for a nice looking grip to improve your comfort or safety on longer shoots the Peak Design Clutch is a great upgrade for your camera. But do check if it is compatible with your camera. Want to buy one of the Peak Design products on their website? Use this link to find their website and get 10% off!